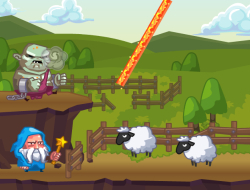 This is a cool wizardry game in which you will be a powerful magician that has to help his people from the stone throwing trolls and ogres. One of your signature abilities is that of constructing magical walls to block the stones and make them bounce back to the enemies. As you progress you will earn money and get to upgrade your other skills, such as heal, or fireball. Each one of them is useful but there are lots of situation this magician will have to be effective in so try to find which one is best to level up. Use the mouse to draw lines and the number keys to use skills. Wizard Walls 10.00 between 0 and 10 based on 1 votes.